Students will practice the use of Punnet Squares to determine the probability of a trait appearing in an offspring. A little game play reinforces concepts. Students will engage in several Scientific Practices – (SP2) developing and using models; (SP4) analyzing and interpreting data; (SP6) constructing explanations. As students work independently to determine the probability of several crosses, they will have an opportunity to explore the Crosscutting Concept: Patterns -"Patterns in the natural and human designed world can be observed, used to describe phenomena, and used as evidence." They will be using patterns to identify cause and effect relationships and use Punnett squares to identify patterns in data. I engage the students in the lesson by displaying my slideshow "Why do I care about Punnett squares?". The slideshow explains how Punnett squares can be used to predict the probability parents passing on genetic disorders to their children. I tell the students that today they will play an online game to practice creating Punnett squares and identifying specific "desirable" traits. I distribute the Furry Family Genetics worksheet and instruct the students to visit the Furry Family website from The Vital Lab (Ohio University). 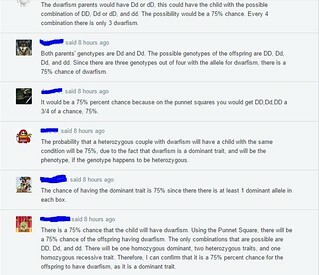 "I see we disagree on the probability for the recessive in the cross between a homozygous dominant and a heterozygous. Why do you think it is 75%?" In order to foster this type of interaction, I tell the students that as I walk the room I will be giving out patriot bucks (school-wide incentive) to students who perform this type of conversation. Watch as a student walks through the activity and then listen to a couple of students explain what they thought about it. Did you catch the last student's change in attitude? "Dwarfism is a dominant trait. What is the probability that a heterozygous couple with dwarfism will have a child with the condition? Explain your answer using the possible genotypes of the offspring." I like to use Edmodo for this type of quick check for understanding since it gives me the data I need to know whether to proceed with the lesson series (as in this instance) or to go back and reteach the concept.